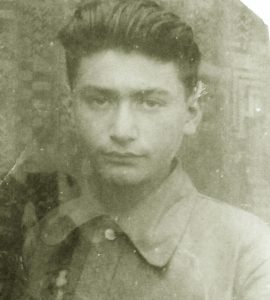 Memories of Katz (Haymovich) Gitlya Moiseyevna (28.12.1916- 13.07.1998) and her younger brother – Boris (Baruch), born on May 7, 1927, who now lives in Israel in the city of Kiryat Ya) recorded by her younger son Alik Katz. 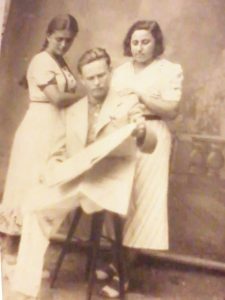 “Mother’s family lived in Orhei in Bessarabia – now Moldova. Mom (on left) and dad. The end of the 30-s.
June 22, 1941 marked the war beginning. Father was called to the Army. Mom with the youngest son Mousik, born on May 2, 1941, her mother Ettle, two brothers Pinea and Boris, and sister Manea loaded the belongings in a cart and went to the village of Vadu lui Voda, and then to Criuleni, where there was a bridge across the Dniester River. On the way, they met Manoli, the familiar of mother’s father Moses (who died in 1940). Manoli overtook the road-roller on the left bank. Boris sat down on the roller, hooked up the baby carriage and went to the ferry. And so they passed the barrier with the soldiers and proceeded to Criuleni bridge. On the way they were bombed. They hid in a cornfield. And there Manoli said that only equipment was allowed to pass to the bridge. Borya with the carriage set off on the way back to the barrier. In the meantime, pedestrians-refugees approached the barrier that separated the family! And then my mother showed perseverance and told the soldiers guarding the barrier that she and the child would not move until they allowed Pinea and Manea to pass and return the younger brother. The soldiers let them go. Fortunately, they found each other and together went back to the barrier. Along the way, they survived another bombing, and spent the night in an attic of kind people who admitted. 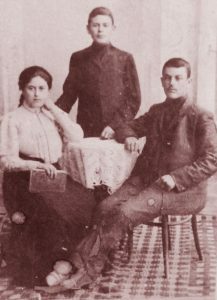 Grandmother Ette with her brothers Reuven and Baruch. The end of the XIX century. Mom with a two-month-old Moses and my grandmother Ette remained to wait for brothers and sister. Mom climbed into a nearby truck to feed the baby. And the truck started and went to the ferry. Mom knocked on the roof of the cabin, asked to stop, but in vain. The driver did not react. She saw the returning brothers and sister, but the car stopped already on the other shore. And mom and her baby were alone in an unfamiliar village of Pavlovka. She always said “the world is not without good people.” And this worked. Mom and the child were sheltered by a resident of Pavlovka. And on July 7, Borya, Pinya and Manya finally reunited with their mother Ette and proceeded to the crossing to Vadu lui Voda. By that time, this crossing was closed and all refugees were sent to Old Dubossary bridge, where at last the family crossed the Dniester. They went into a coastal village and sat down to relax near one of the houses. After a while the owner came out and began scolding them for tearing fruit from her garden. And then grandmother Ette told her that they had gone a long and hard way and just sat down to rest, and she screamed at them because they were Jewish, and accused her of anti-Semitism. “I am anti-Semite?” the woman cried. “Your daughter with your grandson has been living in my home for almost a week!” Mom went out and met grandma Ette!!! By the way, Danya passed all the war in the Army as a sapper. And after the war he helped all brothers and sisters in difficult times. But that is another story. On the main photo: After the war. All survived! Grandmother Ette and her children. Left to right: Gitlya, Manya, grandmother Ette, Borya, Danya, Sarah, Pinya. 50 years. Project ” The Holocaust unhealed wounds” with support Yad Vashem- the Holocaust Martyrs’ and Heroes’ Remembrance Authority and the Genrsis Philanthropy Group.